Save time & money and attract more people to your event! 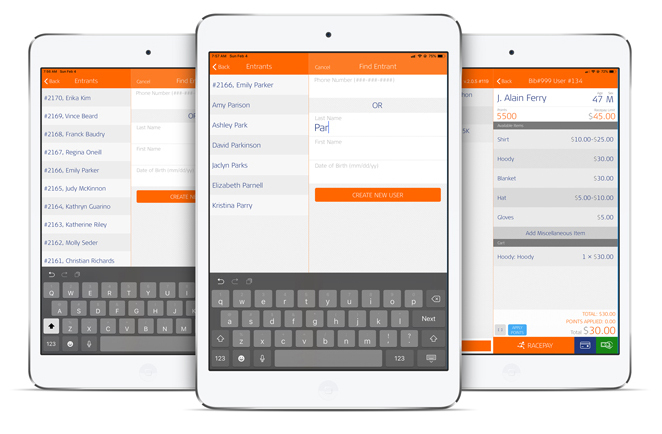 Mobile apps for on-site registration. We are race directors and athletes ourselves, so we understand your needs. Our fully customizable event pages make it easy for you to create your own page, and our integration with social networks encourages entrants to share your race with their friends. Zero monthly and set up fees. Our Raceday mobile application optimizes the race registration and check-in experience at your event. Connected to RaceMenu's vast participant database, Raceday prevents participant data errors, reduces the number of volunteers needed for check-in, and allows you to accept credit card payments without additional hardware. Raceday's dynamic bib assignment saves your event both time and money. As participants check-in at the event, rather than searching for their pre-assigned bib, you simply give them the next bib available. Raceday saves you 10-20 seconds on each participant's check-in process, and reduces the expense of unused race bibs for no-show participants. Events are more fun with friends. RaceMenu makes events more friendly. We help event organizers manage, promote and grow events more efficiently with software and technology. RaceMenu is built by a boot-strapped team of athletes committed to making events more friendly, more fun, and more profitable. We are based in Boston, MA and you can find us at events across New England. Events are more fun with your friends! RaceMenu makes events more friendly by integrating with social networks. If you email us between 10am and 5pm, we'll probably respond within an hour. Note: If your debit/credit card was not accepted, please call your card issuer because we really can't help. Seriously, we're not just saying that.